Rena loved her teacher inspired gelish nail art by Home Nails! The gelish manicure, coupled with gelish nail art was a refreshing change from what she was used to. Read more about it at the link below. She wrote a lovely review of the entire Home Nails Gelish Manicure and Gelish Nail Art experience. She was surprised that such good service and gelish nail art was available in Singapore, and located in such a convienent location, in Orchard Road, near Dhoby Ghaut MRT at The Nomu. Home Nail is centrally located beside The Cathay and near to Dhoby Ghaut MRT and Plaza Singapura. Very convenient and easy to locate the place. Cosy, peaceful, comfortable and relaxing. A place where you can sit back and relax while getting your nails done after hours of shopping or vice versa. 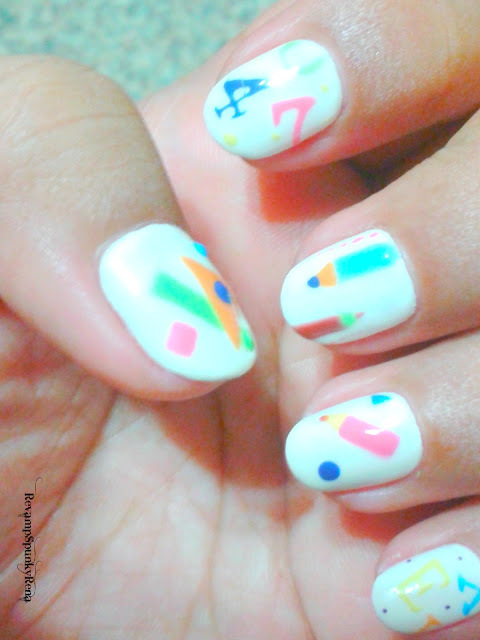 My manicurist did freehand designs and created nice Gelish nail art designs on my nails. Absolutely in love with the finished look. Absolutely flawless, meticulous, creative and detailed. As I walked in, I saw rainbow of colored nail polishes sitting pretty on the display racks. They have any colors you want on your nails! They take impeccable care of their manicure tools and equipment. They always properly sterilize and disinfect their manicure tools. For your information, they also disinfect their seats and remote controls. I was attended promptly as soon as I walked in and this made me feel very welcome and comfortable. My manicurist answered all my questions and demonstrated full knowledge of their products. " Overall, I'm extremely happy with their service, cleanliness and manicurist. I enjoyed my first wonderful experience at Home Nails. I would highly recommend this popular nail salon to anyone!